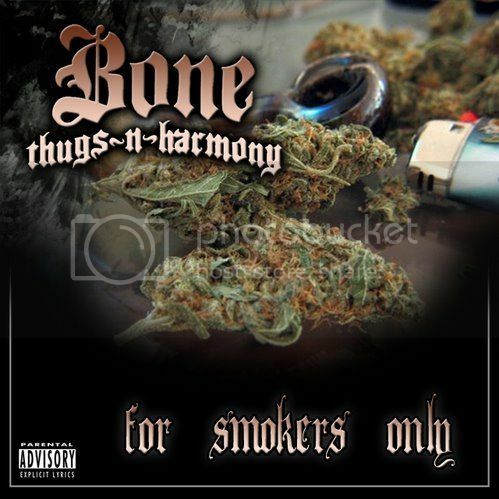 It is with great amazement that we announce a recently-launched Kickstarter campaign in hopes of releasing a genuine BONE THUGS-N-HARMONY weed-tribute album on both CD and LP. This is obviously a unique release to come into our path, and we feel fully obligated to try making this a reality! 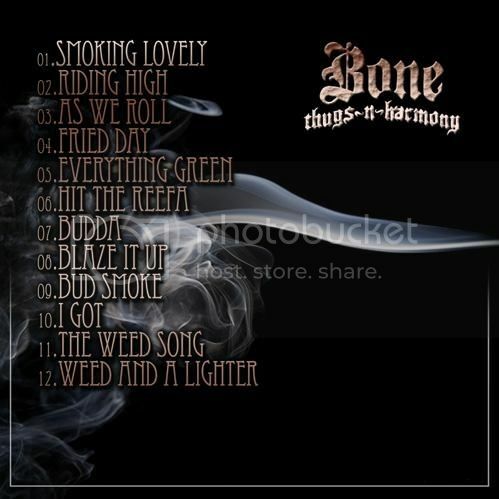 There have been none before or after that accurately compare to the exclusive quality and talent that is BONE THUGS-N-HARMONY, and to unleash this heady collection is a privilege we won't soon forget. Renown globally with over 30 million(!) albums sold worldwide, BONE THUGS-N-HARMONY are true groundbreakers with their unique combination of heartfelt melody and street realism. A variety of vocal speeds and skills are mixed with infectious beats, resulting in unparalleled rap in both substance and style. We're doing this Kickstarter campaign with the goal of raising enough funds to start manufacturing CDs plus both the standard edition vinyl-LP and deluxe DIE HARD edition LP of "For Smokers Only", plus hopefully cover some licensing and legal fees, and basically just work with one of the most amazing hip hop bands on the planet! This is a special opportunity to own BONE THUGS-N-HARMONY material on vinyl, as most of their albums that've been pressed on wax are now long out of print. In combination with the vinyl, a high-quality DIGITAL DOWNLOAD of "For Smokers Only" will be included with every LP ordered. * The CD will be packaged in a jewel case with full-color artwork. * The standard vinyl LP will come on your choice of black or green vinyl packaged in a color jacket, and includes a high quality digital-download of the full album. * The deluxe DIE HARD edition will come on limited "PURPLE HAZE" (purple-N-green) color vinyl housed in an oversized ziplock baggie, an exclusive "bud tribute" slipmat, a hand-numbered 11" x 17" screenprinted blacklight poster, stickers, 1.5" button, full album digital-download AND bonus additional download of the "Everyday Thugs" album! Important Note: THIS RELEASE WILL NOT BE AVAILABLE IN NORTH AMERICA OUTSIDE OF THE LIMITED AMOUNT OF COPIES IMPORTED VIA THIS KICKSTARTER CAMPAIGN!! Because this release is being manufactured and distributed in Europe, pledge prices have been calculated to include the "import shipping" costs for USA orderers. People in other countries can order as well, please just see the "International Shipping" price section of the FAQ found within the Kickstarter campaign, as shipping for this release is a little different (and cheaper) than how we normally do things. We've come up with a variety of different pledge options including super simple postage-paid CDs and LPs, wholesale options, the deluxe DIE HARD edition, a limited TEST PRESS option, plus an elaborate and crazy "VIP MEGABONE" $420 pledge option! Please see the Kickstarter campaign page for all of the details on everything we're offering here. This is running for one month and we're basically aiming to treat it as an "elaborate pre-order". Although this is the most we've asked for to date, after two previous successful Kickstarter campaigns under our belt we're hoping this one will be a success as well. That being said, the other campaigns definitely wouldn't have gone as well without kind people helping us spread the word. Seriously, a post on Facebook/Tumblr/Twitter/your blog/whatever actually helps a surprising amount, and we're totally down to hook up some bonus swag schwag at the end of this crazy thing if you wanna help us spread the word a bit. Just let us know at the end of the campaign if you posted something and we're happy to juice it up. Here's the link, please share it! YEA-UH! That pretty much sums it up! This is easily one of the most exciting and wildest things Robotic Empire has attempted in our nearly 14-year history. We've talked about truly breaking out of our "comfort zone" genres for years, and what better way to do it than with a freakin BONE THUGS-N-HARMONY release?! Nobody (even us) was expecting this, so PLEASE help us make this thing a hit by spreading the word if ya can. So obviously that is the biggest news for us in a while, but far from all we've been up to lately. Besides working on prepping the BONE THUGS project for kind of a while, we've been busy stocking lots of AWESOME new tunes for the Robotic Empire - Online Store. Top on the list this time is the stunning FALSE / BARGHEST split LP, which our partner label Mirror Universe was kind of the catalyst for. A co-release with longtime brethren Gilead Media, this is one of the most blistering and relentless albums we've been involved with to date. Seriously incredible sophomore material from each band following two fantastic debut albums on Gilead last year, we are extremely stoked to have this in house and ready to rock. Dr. Broadcloak himself's timely OCD has proven itself glorious once again with an incredible package with fantastic artwork, a large poster insert and appropriately heavyweight vinyl. Fans of the heavy: DO NOT sleep on this one! 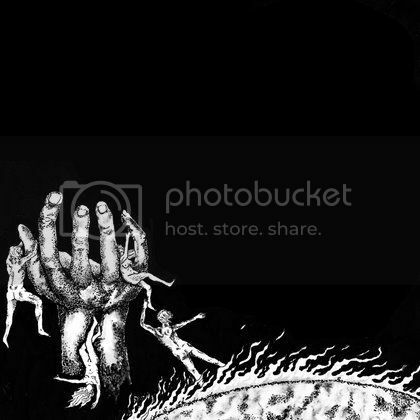 This release is also available to stream in full, with FALSE showcasing their material through the mighty Decibel Magazine, and BARGHEST via bandcamp. FALSE is currently on the road as well: GO SEE THEM if they're coming near you! 9/21 - Phoenix, AZ - Revolver Records - 918 N 2nd St. Beyond that we've stocked STACKS of new records that've been piling up here for a while now... about 40 new items and nearly 30 restocks as well! Basically too much to really highlight it all but we'd like to at least note new jawns from ALTAR OF PLAGUES, ANCIENT SKY, BACCHUS, THE BODY, BRAINOIL, CLOUD RAT, DARK CASTLE, EYEHATEGOD, GHOSTLIMB, GHOUL, GAYS & QUEERS, GRAF ORLOCK, IRON REAGAN, MUNICIPAL WASTE(! ), THE OBSESSED, PLANKS, VADAR, VOLTURE and YEAR OF NO LIGHT. Damn! On the restock tip we're pimpin wares from ANNIHILATION TIME, AUSSITOT MORT, CANNABIS CORPSE, DOLCIM, EARTHLESS, GIANTS, KYUSS (yeaaahhh), LA QUIETE, NEUROSIS, PHOBIA, PIZZA, RAEIN, ROSETTA, TITAN and FINALLY the restock of TORCHE's latest album "Harmonicraft" which we absolutely blew out the first time around. All of that and literally thousands of more items are available now in the Robotic Empire - Online Store. That pretty much sums up one of the biggest updates we've ever had. Thanks to anyone who managed to read this manuscript, you are a trooper and a true dawg! 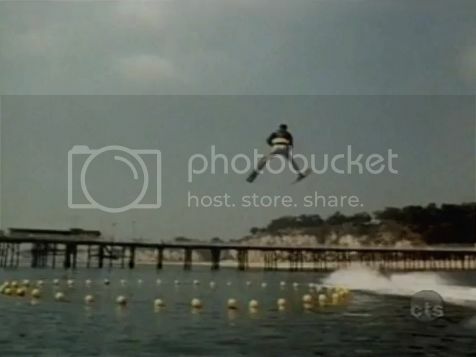 Please check out the Kickstarter if you get a chance.... PEACE!